A new idea for streetwise stitchers - direct from the town square a new range to stick on the fridge or hang on a wall. Here are five little shops, a house and three larger pieces, a bridal shop, a school and an Italian restaurant, and you may change details or names if you wish. 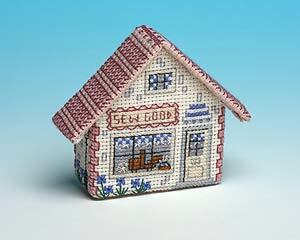 The house and small shops are approximately 6 cms high and the larger pieces approximately 8.5 cms high. It doesn't take too long to produce one of these, so you may soon have a whole street of them! Each kit contains 14 and 18-count aida, felt, stranded cotton, plastic canvas, a magnet, needle, chart and full instructions. This small needlecraft shop looks crisp and fresh with blue and white blinds and curtains and pretty pink details on the walls.